It’s early spring in Kabul. 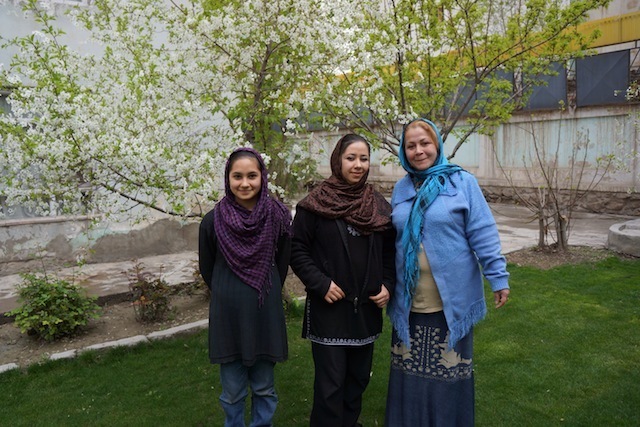 All of the fruit trees are in bloom and the new trees that have been planted by the mayor of Kabul are covered in the bright green leaves that only spring provides. It’s hard to find evidence of hope springing up in a country and a city that has been crushed by war for decades, but nature seems to give it’s signs of renewal no matter what else is happening. Friday was spent catching up with ET’s partner and visiting a Tajik refugee woman and her two daughters. She has been making the wonderful organza jewelry bags that you’ve received if you’ve ever bought some jewelry from Eternal Threads. Since I knew I would be seeing her and could carry the bags home in my luggage I gave her a fairly large order for this trip. This photo with her two daughters was taken in the garden of the home where they live in front of the fruit tree in bloom. Today was a very successful day for us. Our partner and I were able to find the offices of Operation Mercy. a Swedish Organization that specializes in Self Help Groups for women. 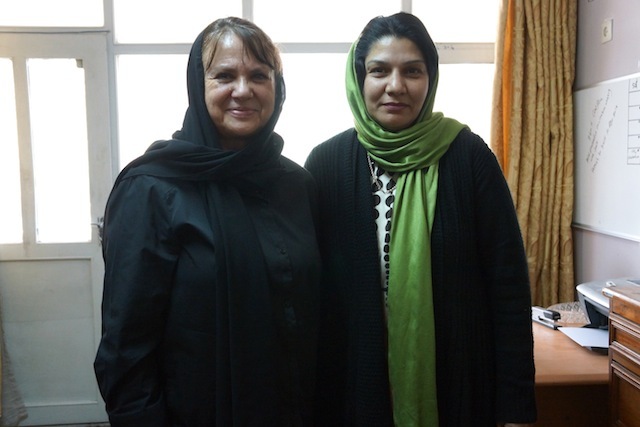 I met with the Afghanistan National Coordinator, Khalida Hafizi (photo below). She was very helpful in giving us the information needed for us to do this program for the women in our projects. I first saw the Self Help Groups in Afghanistan when I was here in 2007 and have since seen the concept in south India and Nepal. It is a fantastic approach to helping women. I am still impressed by the micro-lending concept started by Mohammed Yunus in Bangladesh, but I’m even more in favor of the self-help concept. Women form groups in their own communities, elect officers and a board and begin saving their own money which they will eventually loan to each other. From what I have witnessed this approach is even more empowering to people than receiving a loan because they learn how to do it themselves with their own resources. The groups are also given literacy training and education in human rights issues. In countries like Afghanistan where women are so isolated even from each other, these groups are of great benefit to them socially and economically. Our partner is anxious to learn how to start these groups in our area. Facilitators will be chosen from the women’s groups themselves and they will travel to Kabul for a one week training course hopefully by summer. I did have a couple of spare hours in the afternoon to go to Chicken Street to do some shopping. You’ll be seeing some of the items on the Eternal Threads website eventually (photo below). Everyone from the guest house had dinner at a wonderful Lebanese restaurant where I was able to visit more with the wife of a couple that are staying with us, but I hadn’t had a chance to talk to. They are English and she is a doctor. They are also working with Operation Mercy in that little strip of Afghanistan that borders Tajikistan, China and India. It’s one of the most remote places on earth. They live at 10,000 feet in the winter!!! She told me how cold it gets there and what the temperature is inside their house, but I think I blocked it out of my mind. Incredible commitment. On to western Afghanistan tomorrow to visit our projects. Lunch – the most famous Afghan dish of lamb, rice, raisins and carrots.